Tony Tahhan » Blog Archive » Mahna Mahna… Muhammara! 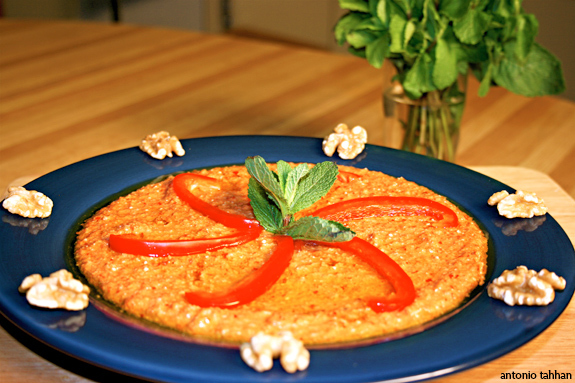 Home » Mahna Mahna… Muhammara! Posted in Uncategorized by Antonio Tahhan on October 28th, 2007. You can follow any responses to this entry through the RSS 2.0 feed. You can leave a response, or trackback from your own site. Muhammara is the best, I love it. Totally addicted to it! My mom mom’s recipe is the same as yours- with the toats incl (an ingredient I don’t find so much on other blog recipes for muhammara). I love muhammara with mashawi, shish taouk etc. the food of aleppo is just great!